Among the artifacts in the ATF archives lies a collection of books written by authors who worked for ATF or one of its several predecessor agencies. One such book, Izzy Einstein ? Prohibition Agent No. 1, by Isador Einstein, tells the tale of his career as an agent in the Federal Prohibition Unit. 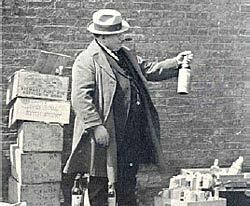 During the first years of the alcohol Prohibition era he became notorious for his success in shutting down speakeasies and similar illegal drinking establishments that were supposed to be "ungettable." Izzy operated between 1920 and 1925 in New York. 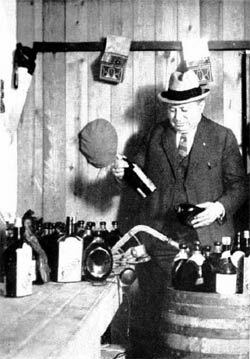 Although known for using disguises to buy alcohol where no one else was able to, and after making 4,932 arrests of bartenders, bootleggers and speakeasy owners (of which 95 percent ended in convictions), Izzy was sacked because he "had become too vaudevillian." Hollywood even made a movie about his unusual enforcement techniques and career. His book, which was published in 1932, was dedicated to the 4,932 persons he arrested, "Hoping they bear me no grudge for having done my duty." Isador Einstein was only 5 feet, 5 inches tall but weighed 225 pounds. When he walked he listed from side to side. He never carried a gun. He wasn't even a professional law man. The job just sounded more fun than his job in the post office. What was his secret? He never looked the same way two investigations in a row. Izzy could speak German, Polish, Hungarian, Bohemian, Yiddish and some Italian. You see, Izzy had a knack for languages and for dressing up, and so every day he would dress a different way and put on a different voice and go into an outlawed drinking establishment and order a drink. When it would come, he would always say the same thing as he cuffed them: "There's sad news here. You're under arrest." 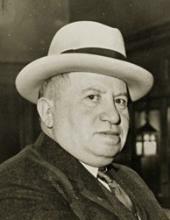 He arrested bartenders as a German pickle packer, a Polish count, a Hungarian violinist, a Yiddish gravedigger, a French maitre d', an Italian fruit vendor, a Russian fisherman, a Chinese launderer, and an astonishing number of Americans: cigar salesman, football player, beauty contest judge, street car conductor, grocer, lawyer, librarian, and plumber. Once, he even dressed up as a black man in Harlem. One day when posing as a department store truck driver he purchased liquor at the Luna Hotel in New York. Afterwards, he delivered a little C.O.D. of his own: "Come on Down to the Federal Building". Many places he went into had a sign warning bartenders about him, but the picture never looked like him on the day he entered the establishment, and so he was completely missed most of the time. He was a sensation across the country, and so, as a gesture of goodwill, the New York City police let him travel to other cities to help there. He was a Mexican laborer in El Paso, a member of a construction crew in Providence, and an out-of-work mechanic in Detroit. At one place in Detroit, the bartender refused to serve him because he insisted he was that "Izzy Epstein." "You mean Einstein don't you?" Izzy said. When the bartender insisted it was Epstein, Izzy bet him a drink. When the bartender poured him a drink, Izzy cuffed him and said, "There's sad news here." He even got to bragging he could get off the train and catch a bootlegger within 30 minutes. Only once did he fail; it was in Washington, D.C. But in Chicago and St. Louis, he found liquor in 21 minutes. It only took 17 in Atlanta, a mere 11 in Pittsburgh. But in New Orleans he broke all expectations by arresting someone in 35 seconds. He had gotten into a cab, and asked the driver where he could cure his thirst. When the driver reached back with some drink, Izzy cuffed him and, you guessed it, said, "There's sad news here." Newspapers of the day referred to him as the Incomparable Izzy, Honest Izzy, and America's Premier Hooch Hound. Izzy referred to his successful operations as the "Einstein Theory of Rum Snooping." In 1927, Izzy was offered a transfer to Chicago. But he preferred not to get mixed up with Al Capone and wanted to spend the rest of his days in New York where he had lived most of his life. So as he put it, "I fired myself." He was later quoted as saying that "now he was no longer a sleuth, he was making more money and getting more sleep." In 1930, after leaving his job as a Prohibition agent, he went to work as a special representative for the New York Life Insurance Co. "Yes, sir!" he said. "What was good enough for ex-President Coolidge is good enough for ex-Agent Izzy Einstein!"